Cardiff Bay on a Friday night. 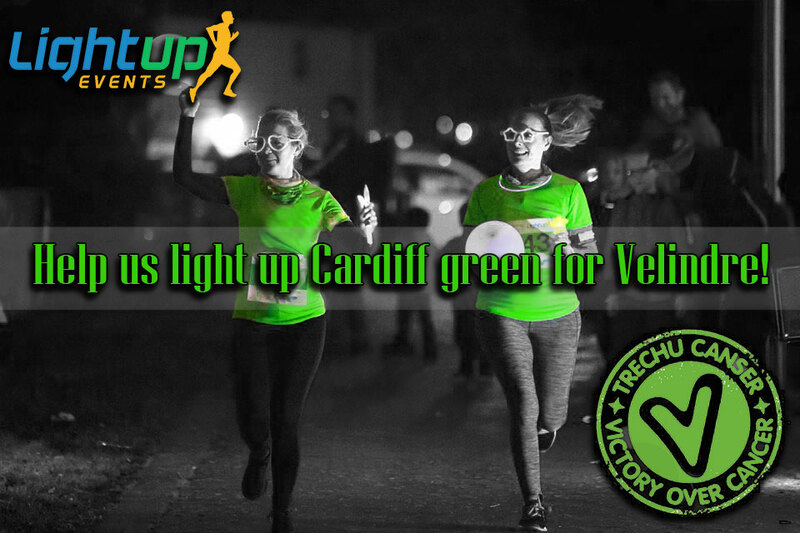 You’re dressed in green, with other runners, united turning the night green for Velindre Cancer Centre. Light Up Events is hosting a fun 3km, 5km and 10km run at Cardiff Bay where we are expecting to have a turnout of over 200 runners. This is the first Light Up running event dedicated to Velindre Cancer Centre and we are very excited to raise funds that will help to ensure the best possible support is offered to every patient, their families and carers dealing with cancer! The donations will also allow Velindre to fund specialist nurses who are fundamental to a patient’s experience and implement projects to improve the physical environment for a patient, such as their gardens, the Family & Children’s Room and so much more. Light Up events are appealing for marshals to point runners in the right direction, runners, volunteers to aid runners with any information they may need on the day. • The 3k, 5k and 10k run is non-competitive. • Personal trainers will be on hand at the beginning to warm up runners. • Runners of all ages and abilities welcome (all runners under 16 must be accompanied by a parent or guardian). Achieving Fitness Ltd. is a personal training company behind the Personal Training School, Light Up Events and outdoor fitness classes at the Marl playing fields. We train personal trainers to qualify in the industry, run personal fitness sessions, corporate group sessions, sports massage and outdoor fitness. In 2015 and 2016, we have held Run in the Dark, raising funds for the Mark Pollock Trust, and from there we made the decision to help more charities, so have put on this fantastic event.